Take on the battlefield with the Airsoft GI Custom AK Kapka AEG Airsoft Gun! The base gun of this custom is based of a E&L Airsoft Full Metal AKPMC-A A110-A known for its reliability and construction. 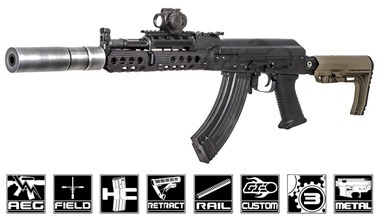 E&L creates their AK AEGs in the same process used to create the airsoft gun’s firearm counterparts; however, E&L uses a process which changes the stamped steel AK receivers from a firearm component into a shell capable of accepting a Version 3 Gearbox. The tech department was able to install a Troy Industries AK47 Rail Short Bottom that is designed to fit onto real firearms. The Asura Dynamics DTK-4 mock suppressor includes an inner barrel that increases the compression of the airsoft gun.